Matthias Dreier had just finished a 157-km race with 22,000 other cyclists and now had to hop into his car to make the long drive home so that he could get to work the next morning. Never mind all that - the 46-year-old sales manager had a big smile on his face. "Cycling is just an incredibly cool sport," said Dreier after taking four hours to complete the race, helped by hearty cheers from 750,000 spectators along the scenic course in and around Hamburg. "I've been riding for 20 years but the passion grows every year," said the hobby cyclist from Baden-Baden who rides 10,000 km a year. "A race like this is great because you see what pros go through." Cycling has become enormously popular in Germany with tens of thousands of enthusiasts taking part in mass public road races each week across the country. With a formula similar to marathons or 10-km running events, bike races often feature a few elite cyclists who help to attract a buzz, crowds and the media. Germans have been deeply disappointed by doping scandals in the professional cycling world, especially the fall of 1997 Tour de France winner Jan Ullrich and the doping-tainted demise of the mighty Telekom team. However, they refuse to be put off the sport and redirect their fondness for it into racing and riding bikes themselves. They spent a record 1.8 billion euros on more than four million bikes purchased in 2010, adding to a staggering total of 13 billion euros spent each year on the sport and cycling tourism. Once-superb television ratings for the Tour de France have plunged so far in Germany that networks ARD and ZDF say they will drop live broadcasts of the race next year. Yet, at the same time, the grassroots popularity has soared to new heights. "It's a wonderful sport and we aren't going to let the past doping spoil our fun," said Bianka Pietz, a designer from Magdeburg who finished her 100km race in Hamburg in three hours. "Cycling's a great way to knock yourself out and have fun." 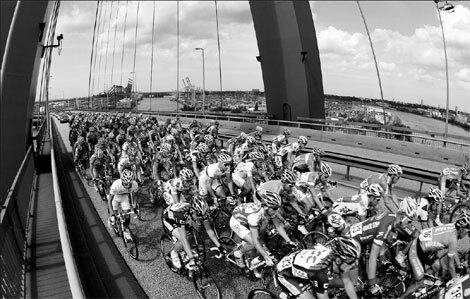 The Vattenfall Cyclassics in Hamburg calls itself the "largest race in Europe" with 22,000 participants split into three distance events - 55, 100 and 157km. There was also a professional race over 216km on Sunday. Boasson Hagen of Norway, who has won two Tour de France stages, triumphed in the professional race in four hours, 49 minutes. Ullrich won the 1997 race. There were 13,500 cyclists at a similar mass race in Berlin in May, the Skoda Velothon, that featured age-group hobby cyclists in distance races of up to 120km in and around the German capital. It was capped with a professional race over 182km, won by Germany's Marcel Kittel. "The popularity of the 'Jedermann' (everyman) races open to the public has definitely been booming," said Marcus Degen, editor-in-chief of ProCycling, a leading cycling magazine. "But not just the big events like in Hamburg or Berlin. "Every weekend you can find a lot of well-organized 'Jedermann' races with thousands taking part in places across the country. People want to test their limits and they'd rather be racing themselves than watching the Tour de France on TV." Degen said cycling had became hugely popular in Germany in the wake of Ullrich's heroics, similar to the boom in tennis that followed Boris Becker's first Wimbledon win in 1985. After Ullrich became the first German to win the Tour, television ratings soared and hundreds of thousands of fans lined the streets to watch the occasional stage whenever the race crossed the Rhine to Germany. "But the popularity suffered a big hit after Ullrich was thrown out of the Tour in 2006," said Degen. The Deutschlandtour, Germany's top multi-stage tour for 10 years, was scrapped in 2009 as cycling stumbled from one doping revelation to another. "Since 2006, the number of people taking part in racing themselves has grown continuously," Degen said. "A lot of people decided they'd rather be out cycling themselves than sitting in front of the TV for three weeks in July." In an age of worries about climate change and rising petrol prices, more and more people are commuting by bike. In Berlin, the percentage of journeys every day made by bike has risen to 14 percent from six percent over the past 10 years. "There's a clear trend towards more cycling in Berlin and other cities every year," said Michael Cramer, a leader in the German Greens party and a member of the European parliament who has not owned a car since 1979. "There are the environmental aspects for some people but also economic and practical reasons," added Cramer, who was a catalyst behind the 160km Berlin Wall Trail - a cycling path that follows the route of the former divide between East and West Berlin. Berlin is home to a huge rally each year when up to 250,000 people take part in an Earth Day bike demonstration over about 50km, up from 10,000 participants in the first year in 1995. "It's become the world's biggest bike rally," Cramer said. Degen said cycling was the "new mobility" and more people were taking their bikes on holiday with them. "If you're on the motorway, it seems like every third car has bikes on a roof rack. Hotels also cater to biking tourists more and more." He said owning an expensive bike had also become a matter of status. "Some cyclists don't think twice about owning a 7,000-euro bike," he said. "For some people it's a sort of status symbol. I think most people enjoy cycling and racing because it's a lot of fun."